24 I have been praying my Decade daily. Each week now, I read the Reprisal Psalm, sing in the choir and help with the opening prayers of the service. We need more information on the Rosary and Scapular. Your materials give us great strength and much hope. &lt; Juan - TX &gt; I max out of prison on April 2, 2018. Monday morning, I will have served 10 years for a crime I did not commit. But I got away with so much in my life; I had to get incarcerated for something. I have seen so many people in prison commit suicide for no reason at all. I refuse to give the devil the glory of harming myself. I know, I am a sinner and have fallen short in God’s grace. But I repent and confess all my sins and ask God to forgive me. &lt; Kenneth &gt; It is my great pleasure to tell you that, after 25 years in prison, I am finally home on parole. In your last letter, you mentioned that, once I am home, you would send me some religious items and a Pardon Crucifix. Things are going well and I am getting use to the changes in my life. I managed to get a 6-month old Lab puppy. He is great company. I go to Mass every Sunday but cannot go more often. I am on limited parole. My heart is troubled over my brother and his family, and my sister and her family. They refuse to speak to me or even to see me. My brother was only 16 and my sister was 15, when I was arrested. I was not a nice person then and was a drunkard and doing drugs. Please ask God to touch their hearts and help them forgive me. I want to thank you for your help during my years of incarceration. I cannot express how much they meant to me. The Living Rosary was my anchor. I thank God for your organization and look forward to hearing from you! Respectfully, &lt; James &gt; I am writing to request a Roman Catholic Calendar for 2018. The 2017 issue was very inspirational. I am 600 miles west of you and very isolated. The chaplain on this Unit does not provide us with religious materials. I have formed a sanctuary in my cell and find refuge sitting there viewing all the materials and holy cards you have sent. I hope my conviction to prayer remains strong. The other day, during a random shake down, the Lieutenant, while searching my property, threw my calendar and Rosary beads on the floor. I felt disrespect and persecution. I use to fish in the Kemah shores and so am aware of the Galveston-Houston Archdiocese. I offer my condolences over your losses due to Hurricane Harvey. I am an electrician with over 30 years of experience in commercial and industrial and, when I get out, my help is offered to you free of charge. Pray for me. &lt; Michael &gt; The newest pamphlet, “Where Mary Reigns as Queen, Christ is King” is a beaming light of mercy in the darkness which surrounds us. Your ministry of love is bringing light to the darkest of places. With Rosary in hand, the darkness flees from me because I am bathed in the light of Our Blessed Mother’s love. I am praying for you, Ms. Patti. 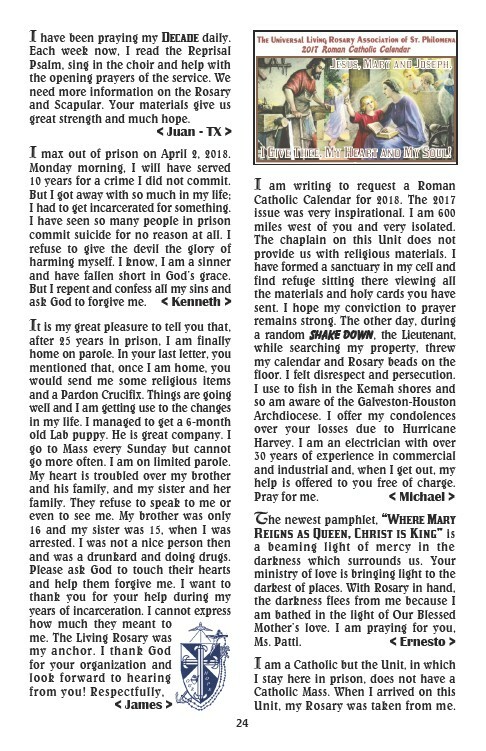 &lt; Ernesto &gt; I am a Catholic but the Unit, in which I stay here in prison, does not have a Catholic Mass. When I arrived on this Unit, my Rosary was taken from me.